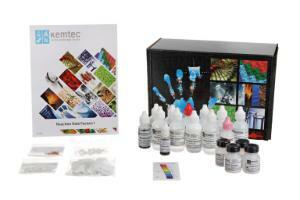 Demonstrate the effect of concentration on the rate of the iodate/sulfate reaction. Students determine the reaction times for mixtures of differing concentrations of sodium sulfite and sodium iodate, then quantify the results by graphical analysis and calculating an empirical constant. The kit contains six depression plates, plastic stirring sticks, 24 plastic drop bottles, one bottle of starch solution, six drop bottles of HCl 0.1 N and one vial each sodium sulfite and sodium iodate. Tests can be repeated five times. With 24 student worksheets and a teacher’s manual. Materials supplied for 24 students.